The Lowcountry Romance Writers (LRWA) is a chapter of the Romance Writers of America based in Charleston, South Carolina. It’s one of the first writing groups I joined to learn more about craft and connect with other writers. Throughout the year, it offers monthly meetings with speakers and a number of online classes. In the summer, it sponsors a beach retreat that provides a fabulous location for exciting programs, engaging fellowship, and enjoying the sand and surf. Because I live two hours away, I don’t always make the meetings, but I do try to be there in March, when certificates are handed out to celebrate members’ accomplishments. It’s always a great party. This year, we had a truly decadent chocolate cheesecake topped with raspberries, raspberry syrup, and fluffy whipped cream. Even though the dessert was quite a lure, the focus remained on encouraging each other and cheering each person’s new achievements. We were lucky to have the perfect speaker in Dorothy McFalls. The mystery community knows her as Dorothy St. James, author of the White House gardener series with plucky protagonist Casey Calhoun. On Amazon, Dorothy McFalls is a top rated Regency romance writer. Gradually, she moved beyond the “loser writer” status to be captivated by her characters. She explored publication options, identified the publisher she wanted for her work, and read all the books the publisher released. Eventually, she found an editor who believed in her and became her champion. After the release of her first novel, she worked on another, but didn’t have it completed when the editor asked for it, so another author got the opportunity. Then, the publisher went out of business. Dorothy told us, “Stumbling may be the best thing.” If her book had been ready, it might have advanced her career, but she was pregnant at the time, and when she sat typing, her baby’s heart would stop. (I’m very happy to report that Dorothy, her husband, and beautiful daughter Avery are headed for Disney World!) When her book was finished, she found another publisher. In her words, “It’s amazing how each book builds upon the others and that never goes away. As Dorothy pointed out to us, the definition of passion encompasses love, hate, and suffering. Writers usually experience all of those emotions in pursuing their work. Dorothy suggested the following five ideas to keep writers focused on their tasks: (1) each person is uniquely qualified to tell a story; (2) craft can be learned and mastered; (3) anything you write can be revised; (4) allow yourself to make mistakes; and (5) always believe in your dreams. Finally, Dorothy left us with these recommendations for making a writing career. Write every day, if only one page. Search your mind and decide on the novel you need to write. Hope you can always embrace writing as a new author, excited about the adventure. Part of the great gift of belonging to a writing community is being among people who have been where you are or have gone where you want to go. It’s inspiring to hear how they combatted the lows and achieved the highs. And, it’s a wonderful assurance of your own accomplishments to be able to offer encouragement to others just beginning their journeys. I’m grateful to be a member of LRWA and appreciate the friendships and support from its members. Congratulations to everyone, for all your accomplishments (from beginning the submission process to lifetime achievement) and best wishes for the future. What organizations help sustain you in your writing? 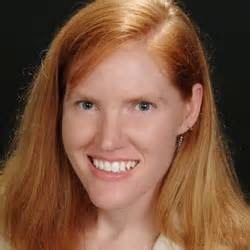 Not only is Verena Rose the chair of the Malice Domestic Conference Board of Directors, she is also coordinating, along with Rita Owen, the upcoming Malice Anthology, Murder Most Conventional. As you can imagine, she’s one busy lady. Verena took a few moments to tell us what’s new at the conference and to give us the scoop on the Malice anthology. How did you first get involved with Malice Domestic? I used to go to the Mystery Bookstore in Bethesda that was owned by Jean and Ron McMillen. I got to be friendly with Jean and she told me about an opening on the Board for Author Liaison. I had been attending since Malice VII so I thought it might be a good way to meet people and get involved so I told her I would be interested. I was elected to the Board for Malice XI as Author Liaison. I’ve also served as Program Chair, Treasurer (for several years), Agatha Chair, and now I’m in my ninth year as the Chair. As you can imagine, it’s labor of love for me. You know what they say about Malice: Too much to do in too little time! I don’t think Malice is any different than any other convention in this regard. There are always too many choices and too little time. Any changes afoot for Malice this year? I noticed that instead of the Poison Lady, this year we have the Iron Coffin Boy. Unfortunately, the Poison Lady had a conflict and cannot make it to Malice this year. We expect that she’ll be back with us for Malice 28. David Hunt and Deb Hull-Walski, Forensic Anthropologists, will talk about how researchers solved the mystery of a boy in an iron coffin discovered by utility workers. This year a new Malice anthology, Murder Most Conventional, was announced. The addition of the Anthology this year doesn’t really impact the convention process for the attendees. It really only impacts the Board and those individuals who are planning to submit a short story for consideration prior to the deadline which is May 1, 2015. It just happens that that is also the first official day of Malice 27. I think the best information about the previous anthologies can be found in Not Everyone’s Cup of Tea (NECOT) in an article by Beth Foxwell entitled “Malice Anthologies: Malice in Small (and Lethal) Doses.” As for why we decided to do one for publication in 2016, well, Rita Owen and I had such a good time doing NECOT we decided to see if we could reboot the anthologies. We approached Wildside Press and they have agreed to again be our publisher. This anthology – Malice 11: Murder Most Conventional we hope will be the first of many to come. We already have ideas for another Murder Most…. How can writers submit to the anthology? All royalties earned from sales of Malice Domestic 11: Murder Most Conventional will be used for the Malice Angels Project. Each year, the Malice Angels Project provides comprehensive registration for up to two individuals who are in need of assistance to attend Malice Domestic. Selection of the stories to be included in Malice Domestic 11 will be made by a panel of three award-winning members of the Malice Domestic community, none of whom is a member of the Malice Domestic Board of Directors. The names of selection panel members will remain anonymous until the selection process is complete. Malice Domestic 11: Murder Most Conventional will be presented by Katherine Hall Page and published by Wildside Press in time for Malice Domestic 28, which will be held at the Hyatt Regency, Bethesda, MD, April 29-May 1, 2016. You are chairing the convention, managing the anthology, and moderating panels. I hope you are planning a spa vacation to recuperate afterwards. How do you do it all? The main thing is that the Malice Board is an incredible group of individuals that works enormously well together as a team. That being said, there are still days when I’ve got several balls in the air at the same time. I also work a full time job as a tax accountant. Thankfully, I now work from home so I have a couple extra hours a day that aren’t eaten up by a commute. So to answer your question, after April 15th I have plans to get a haircut, mani/pedi, and just relax for a couple of days before I do my final organization for Malice. And one of my best friends that I met at Malice IX will be coming to spend several days with me before we leave for the convention. Those that come immediately to mind are Louise Penny, Lindsey Davis, Katherine Hall Page, Martin Edwards, Charlaine Harris, Dana Cameron, Elizabeth Peters, Peter Lovesey, Anthony Horowitz, James Lee Burke, Jan Burke, Robert Crais and a list too numerous to mention. I will say that I am particularly fond of historical mysteries. And while she’s not a mystery author, I am a huge fan of Jane Austen and consider myself a Janeite! Thank you so much for stopping by WWK, Verena! Readers, have you attended Malice? Are you planning to go this year? We designed our route from Georgia to Oregon to visit as many National Wildlife Refuges as we have time for. I’ll check off a bucket list item when we catch the sandhill crane (Grus canadensis) migration as it hourglasses at the Platte River. As many as a quarter-million cranes pour into the Platte region as they move up from the bottom of the hourglass encompassing the Gulf of Mexico through Arizona, pinch at the Platte and spread across northern North America. 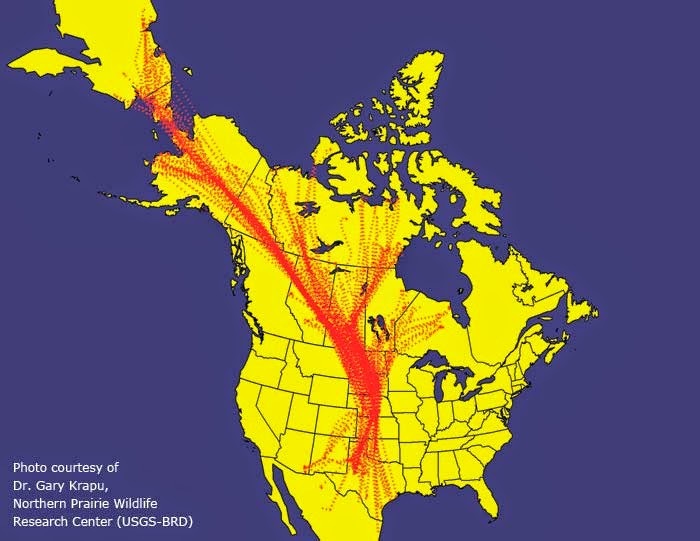 (There are other sandhill crane flyways in North America, but this is by far the largest.) We’ll be there at the end of the migration, so we’ll see how many cranes are still around given the early warm Spring in that part of Nebraska. In Oregon I’ll spend six days improving my writing skills at the Donald Maass workshop while Jan tours the area around Mt. Hood and visits friends in Portland. On the second portion of the trip we’ll catch family in St. Paul, Minnesota; I’ll participate in a bridge tournament at Lake Geneva, Wisconsin while Jan visits family in Highland Park, Illinois; we’ll visit more family in Rochester, New York and some of Jan’s childhood friends in Lansing, Michigan. Given the early warm weather, we expect mud season will be over by the time we reach home. If not, we’ll add an extension onto our trip until we can drive in the last fourteen miles of logging roads to our place! I plan to take a photograph every fifty miles, no matter where we are. The process will provide a visual record of the topography and vegetation changes as we move up from twelve feet above sea level across the Appalachians, back down into the Mississippi drainage, up into the plains, over the Rockies, and back down toward sea level as we reach the West Coast areas. The only gaps in our photographic recording will be when we drive at night. If you want to follow the trip, I’ll be posting on my personal Facebook page, and I expect to add more pictures using my personal blog My Two Cents (Before Inflation). So come along with us on the trip, if you wish. I’ve discovered our friends fall into two camps: those who think this is a marvelous idea and those who think we are bloomin’ crazy. Which group do you fall into? The Sheep ranks as one of the animals that people like most. It is gentle and calm. The cute creature often reminds people of beautiful things. This has been an awful year for pets. I lost my eldest cat, Starlight, on New Year’s Day. I posted my tragedy on Facebook. The feedback was amazing, including posts from others who had lost their pets recently or on the same day. A week later, a very good friend discovered his eldest dog had a serious kidney condition. The dog weakened and died in less than a week. Now my cat, Fred, has been diagnosed in kidney failure. He has 20% kidney function and his bone marrow is not producing new red cells. As a result, we are infusing him daily, and I am giving him three injections a week of EPO (yep the same stuff that cost Lance Armstrong his titles). So far, Fred is responding well, is much more active, and is getting his pink nose back. What is not happening is an increase in his kidney function, so it’s still a matter of time. Why this tale of woe. I mean, really, I can whine in private. Well, it’s because there is a flip side to this. What you may not know is that once upon a time, I was president of PAWS Animal Welfare Society an animal rescue organization in Fort Kent, Maine. Our mission extended only to cats; we did not have the facilities for dogs. Our lack led us to work closely with local Humane Societies, one of which was Holton Humane Society. For the past year, I’ve been reading about Emerson, the Cat with Heart. Here is his Facebook page Emerson the Cat. When the stories first started, I had no idea who Emerson was, or why he had heart. I thought he was more myth than real. An invention of cyberland. I was shocked to discover that not only was Emerson real, he was injured, saved, and rehabilitated in my old neck of the woods. Those are the stories that keep us rescuers going. The success stories. Holton Humane has limited resources, all non-profits do. But they went the extra yard and saved a cat that they knew would never bring in an adoption fee. I doubt they expected his story to go viral, but I’m glad it did. It calls attention to why Humane Societies exist. First and foremost, they are all about the animals. They bring kindness, love, and hope to animals that have experienced harshness at the hands of humans. What is most amazing is that these animals do not hold grudges against the race that caused them so much harm. Instead, they repay the cruelty with unconditional love. What about you? Do you share your life with a critter? How did you acquire him/her and what does the pet mean to you? At the recent Left Coast Crime 2015 event I was on a panel with Jennifer Bosworth, Linda Gerber, April Henry and Mary Elizabeth Summer entitled: Not Safe for Children: The Young Adult Crime Story. I had a good time starting with hearing everyone’s brief biography, which we each had written and submitted. As moderator, Jennifer Bosworth asked good questions and the panel members responses were interesting. The audience questions were also good. Many audience members asked about the differences between writing for a YA audience and writing for adults. I had prepared for a question I was not asked. Since I don’t want to waste the time I spent in research on merely educating myself, I decided to write this blog. Would you care to discuss the recent rather heated discussion about whether or not adults should feel embarrassed by reading Young Adult books? What an intriguing question. First, I would say based on a 2012 survey by Bowker it appears that most readers (55%) of YA book are adults. So either a lot of readers need to feel embarrassed or there is something about YA books that appeals to adults as well as to young adults. I favor the second possibility. Historically there was no genre known as YA. Adults read Catcher in the Rye and Huckleberry Finn without apology. Today they would be labeled YA. While some YA books are trite, so are some books in all categories. I believe some truly excellent literature is now categorized as YA. John Green’s The Fault in Our Stars, Sherman Alexie’s The Absolutely True Story of a Part-Time Indian and Daniel Woodrell’s Winter’s Bone will be considered classics. I make no apology for writing Middle Grade and Young Adult fiction as well as fiction for adults. And they all go marching out in the big parade. So why am I blogging about ants today? Because sometime around Easter is when the ants start marching into my house. When I had children, they were attracted to the Easter candy the kids often stashed under their beds or in their closets hidden from their siblings but not the ants. 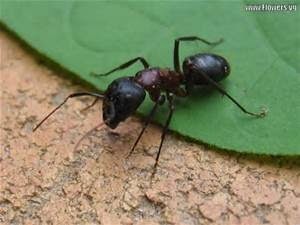 Last week I saw an ant in the living room, a black ant a little larger than the usual ones I get on my kitchen counter. I dispatched that lone scout and haven’t seen another one yet. I find ants fascinating, but not in my house. Years ago back in the precomputer days, my husband discovered a bunch of flying ants near the house, or were they termites? I dug out the encyclopedia to research them and ended up spending several hours reading about ants. (These were not termites.) I was fascinated by them. Years later I read the book Naturalist by Edward O. Wilson, an autobiography of his life starting as a boy naturalist and his developing later as an entomologist studying ants all over the world. A university professor at Harvard (at least at that time in the 1990s) he won two Pulitzer prizes for his work. I loved his book and it increased my interest in ants. Of course, that doesn’t mean I want them building their nests in my perennial beds or have them scavenging for food in my house, but their social structure never ceases to amaze me. Each ant has its own job in the colony, and they communicate with one another. Watch as one ant comes up to another. They’ll touch feelers which convey some message. The scouts also leave a trail for other ants to follow to the food source they’ve found – on my kitchen counter, for instance. I don’t use poison in getting rid of ants in my house. I sprinkle borax at the back of my counters where they come in and spray the counters with window spray where they’ve left their trails. Eventually, they disappear. My sister said peppermint oil works, too. In February I heard on NPR of a study being done on “Taking Traffic Control Lessons – From Ants,” by Brandon Kiem. The point of the discussion or study was that if humans acted like ants, they might spend less time in traffic. Audrey Dussutour, a University of Sydney entomologist, says. “We should use their rules.” She said, “I’ve been working with ants for eight years, and have never seen a traffic jam – and I’ve tried.” In her latest discovery, in the February issue of the Journal of Experimental Biology, Dussutour’s team found that leaf cutters organized themselves into separate and tightly organized streams of load-carrying ants, and unburdened ants going in the opposite direction on wide paths, and then again on narrow twig paths like our one-lane roads. They discovered that the ants leaving the colony, automatically gave the food-bearing ants the right-of-way. 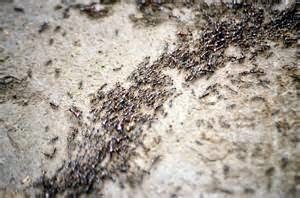 Those ants returning without leaves gathered in clusters behind those with the leaves and traveled behind them. 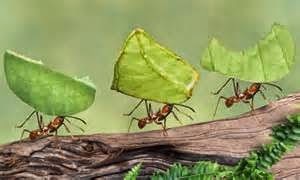 If people behaved more like ants, there would be less road rage and fewer traffic accidents causing injuries and death. 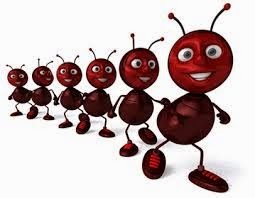 There are some people who feel driverless cars of the future may be the solution to traffic jams and accidents and cause our car travel to be more like that of the ants. How do you feel about ants? Are you looking forward to driver-less cars? 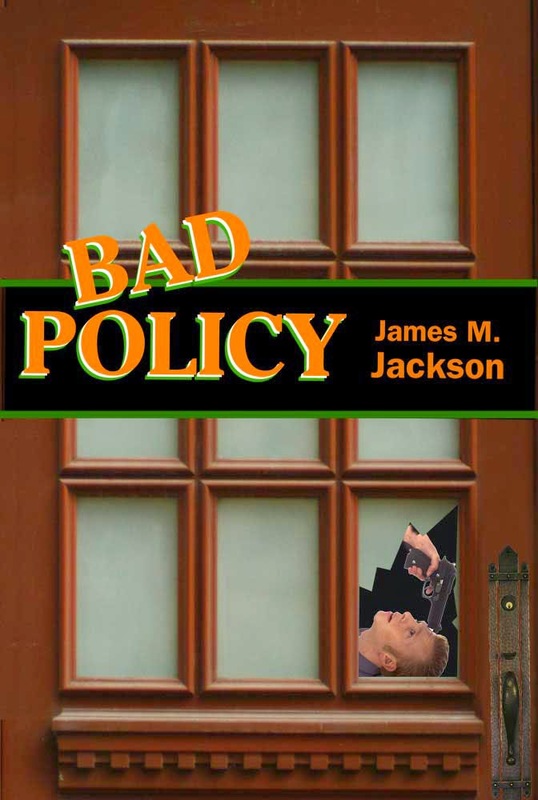 In this prequel to Bad Policy and Cabin Fever, Seamus McCree escapes his desk-bound duties as a financial crimes investigator and takes the field to combat the evil behind two heinous crimes. Seamus also worms his way into the Cincinnati Police Department's murder investigation of a church friend's fiancé and determines police have developed neither suspect nor motive and are speculating the hit may have been the mistake of a dyslexic killer. In each case, Seamus uncovers new, disturbing information of financial chicanery and in the process makes himself and his son targets of those who have already killed to keep their secrets. 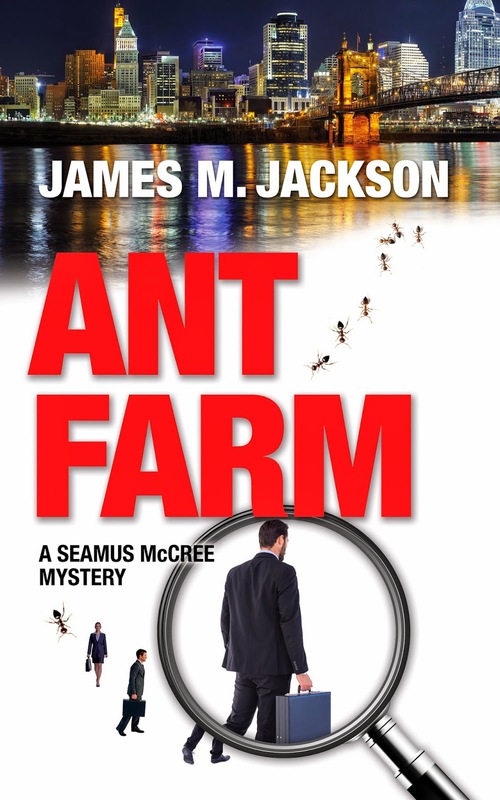 Jim Jackson’s main character, Seamus McCree, investigates crime or potential crime in the financial realm. The results of Seamus’s analysis reveal motive for murder. Jim put Ant Farm in a drawer for thirteen years while he improved his writing skills. This act of discretion amazed me because the book captured my attention, grounded his series, and introduced me to characters that I’d met before but from whom I felt alienated. In Ant Farm, those characters come alive. I have to admit, when you start reading Jim’s series, I recommend reading Ant Farm first. It sets the stage for Bad Policy and Cabin Fever. The cases presented in this book ricocheted, catapulting the action and kept the plot moving. It’s my personal favorite so far. Why present a prequel to your readers, Jim, or was that novel lying in the drawer just bugging you? For years I had referred to Ant Farm as my practice novel. I actually abandoned it in 2006. I knew many series authors used their first novel as a marketing tool. Not having that flexibility because of my traditional publishing contracts, I wondered if Ant Farms’s basic story had legs. It did, but needed a total rewrite to reflect my much-improved writing skills. However, I would not publish it unless it was at least as good as Bad Policy and Cabin Fever. Early readers agreed with your assessment that it passes that test. Paddy and Seamus are often at odds. It’s not surprising given that Paddy is a younger, college-age student, but they lie to each other at times by omission. Why, and why doesn’t Seamus trust Paddy? Seamus is once burned, twice shy. When Paddy was in high school, he hacked a defense department computer system and published some embarrassing expense reports. The FBI did not look kindly on that escapade. Paddy cooperated and showed them how he accessed the data. They threatened to put him away if they caught him again. Seamus is in some ways an overprotective parent, and in Ant Farm Paddy is still working to be independent. When a younger member of Seamus’s church choir asks him to help solve her fiancé’s killer, Seamus doesn’t want to take the case, but he does. Why? Seamus knows he is not a licensed investigator, but he loves to solve problems—especially if other people can’t. And he likes to help people. The combination in this case is too much to resist once he figures out how to work under the auspices of the Cincinnati police department. CIG, Seamus’s employer, is hired to investigate the botulism deaths of twenty-eight people at a company picnic. Why does the Ross County sheriff’s department suspect anything other than accidental death? They are sure the botulism deaths are murders because the only foods infected were those at one particular Labor Day picnic, even though food used at other picnics had been prepared at the same time and place. What they can’t figure out is the motive. They ask Criminal Investigations Group (CIG) to investigate the company’s financials to see if there is anything suspicious. Lt. Hastings and Detective Bear are wonderful secondary characters. 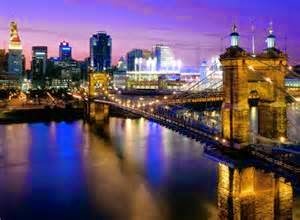 They are in comparable positions, but the large, urban Cincinnati police department employs Hastings, whereas Bear is a detective in the smaller, more rural Ross County Sheriff’s department. While Hastings not only welcomes Seamus’s help, she also gets a contract for his company. Bear thinks of Seamus’s involvement as interfering even though his sheriff requested help. 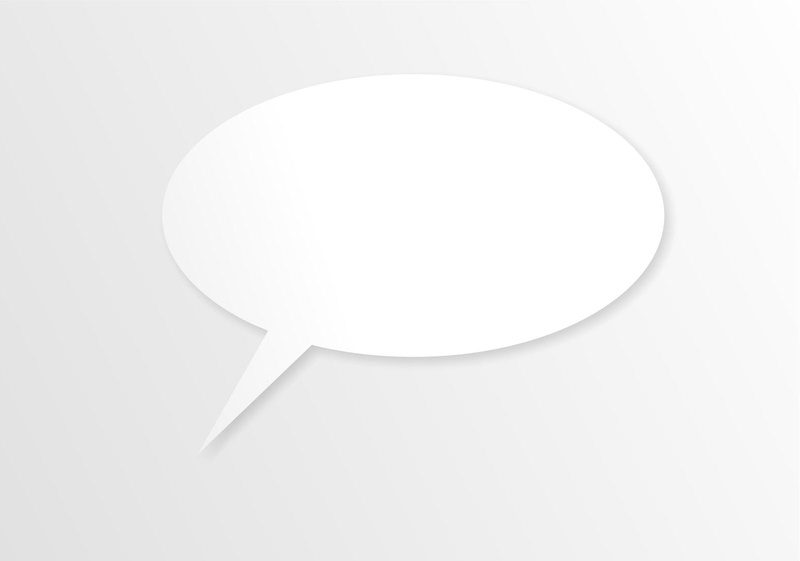 Tell our readers about these characters and why they have such different approaches? I love creating interesting secondary characters. Lt. Hastings is the first female African American to head the Cincinnati homicide division. Bear is a local sports hero come home. Hastings is overworked, understaffed, and has had success with Seamus and CIG on a previous case. She’s not particularly interested in bureaucracy; if someone can help her out, she’s all for it. Bear works for a small county sheriff’s department beset by a huge murder investigation. The sheriff (a politician) crams CIG and Seamus down Bear’s throat. He takes it as criticism of his abilities. I doubt any of us would be too happy under those circumstances, but to Bear’s credit after Seamus gives him an out, he admits he could use help understanding who might have financially benefited from the murders. In previous books, Seamus and Abigail have a romantic relationship. You introduce her in Ant Farm, explaining how the two came together. From the start, there is mutual attraction, but then Seamus also has a flirtatious relationship with Lt. Hastings. Is Seamus a typical middle-age divorced male on the prowl? Seamus was divorced when Paddy was young and for years shied away from any permanent entanglements. He didn’t want to do anything that jeopardized taking care of Paddy. (I think many real women have made similar choices.) Paddy is now in college. Seamus was interested in Hastings when they first met (a bit before Ant Farm), but Hastings was hooked up with a Cincinnati Reds baseball player. She’s available now and starts to return the interest. Seamus is not sure how to react. He has an active libido, but he’s not really on the prowl. He knows something major is missing in his life; he’d like to have a lasting relationship, but he’s not sure how to go about it. Your motive for murder is totally reprehensible and amoral. A slap on the face. Explain the annuity balance sheets and stock price affects for our readers. Was your case based on any true-crime? I’ll answer the second question first. I made this all up. However, I am aware of people who have manipulated pensioner databases for criminal purposes. If you don’t like spoilers and have a good memory, skip the rest of this answer. Annuities are promises to pay a certain amount each (usually) month for as long as the annuitant lives. There may be death benefits, but let’s ignore those. If a private employer or insurance company is on the hook for paying your annuity, they have a financial incentive to kill you. If you die prematurely they don’t have to pay you any more money. As a corporation, that gain adds to their profit. Increased profit generates increased stock prices. In this case, the folks who sell annuities are insurance companies. Therefore, if an insurance company killed its annuitants, it would reap additional profits, and its stock would go up. Seamus’s life is threatened many times in Ant Farm. Most of the book he is trying to heal from a car accident, which wasn’t really an accident. His shoes, tires, SUV are destroyed. He picks up the tab for several airfares and pays out of pocket for many items while on the case. Is he rich or does he have a large expense account? Seamus earned a lot of money when he worked on Wall Street as a stock analyst. Not the huge sums investment bankers earn now, but still enough. He quit when his bosses changed one of his reports because it was negative about a client of his employer. While not super-rich, he doesn't have to worry about money and can afford to accept financial expenses that regular people cannot. A contract killer has been employed to execute Seamus. Your book is mainly written in first person. However, you chose to acquaint the reader with the professional hit man by writing his chapters in an anonymous third person. Why? What compelled you to write him into the story in this personal way? I couldn’t help but think of Rand, Seamus’s boss at CIG, as sort of a John Bosley in Charlie’s Angels. He’s not a hands on sort of guy but calls the shots from over the phone. Seamus likes to make his own decisions, which defy Rand’s decisions many times. Why doesn’t he fire Seamus? Funny you should notice that similarity, E.B, because I had it in mind when I created Rand. We never see him, yet he has a presence. I think of Rand as something of a father figure. He is so prim and proper, yet he cares deeply for his employees—as evidenced by his behavior toward Seamus. He gave Seamus a meaningful task (to create the financial crimes group for CIG) when Seamus left Wall Street in a huff. I suspect Rand tears his hair out when Seamus veers off the path he wants him to travel. Like a good parent he gives Seamus room to grow, but then worries he has provided too much space so Seamus will come to harm. Eventually Rand and Seamus will either have to agree on limitations or Seamus and CIG will need to part company. Stay tuned. Would you like to explain the symbolism of your title, or would you rather leave that up to reader interpretation? “And the ants don’t know you’re watching them,” Paddy added. You leave the relationship between the contract killer and Seamus open. Will readers meet Mr. “Guaranteed Results” again? 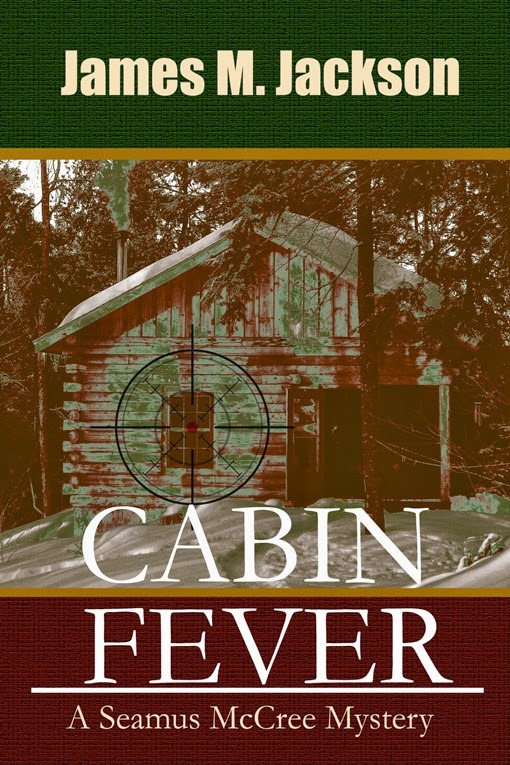 I know the basic plot of the “E” novel (Empty Promises), which will take place in the Cabin Fever environs of Michigan’s Upper Peninsula (this time in warmer weather), and “F” (not titled), which revolves around Boston. I don’t want to give away how, but the Happy Reaper and Seamus will meet and compete in that story. Did you regret that your first book in the series ended up coming third in sequence but not time? If you alphabetically line my books on a shelf you’ll read them in Seamus order rather than publication order. Fortunately, each book is not only part of the series, but a standalone novel. Readers can enter the series through any book and go back and forward in time. What’s next for Seamus McCree, Jim? I am working on the (I hope) last rewrite before submitting Doubtful Relations to my publisher. Seamus’s ex-wife’s husband goes missing and the whole extended family gets involved searching for answers. I have the premises for two more sketched in my mind. In Empty Promises Seamus stumbles over the body of a guy who works for an organization that is planning an open pit mine near Seamus’s home in Michigan’s Upper Peninsula. That novel will address mining and drug issues in the U.P. In the “F” novel, Seamus’s “Uncle” Mike is murdered. Seamus is his executor, as he settles the estate he uncovers unexpected assets and history relating to his family (naturally, while trying to find the murderer). I’m having a great time writing about Seamus and friends. Of course I can continue only if people enjoy reading what I write. I’m so glad you liked Ant Farm¸ E.B, and thanks for the great questions. Even though it’s officially spring, my area looks dull, drab and dreary. The grass is brown. Leafless brown trees line my neighborhood like wooden pitchforks standing sentinel over brown, wooden fences. Occasionally the brownness is broken up by a splash of color from a freshly washed car. During this endless winter of sensory deprivation, my senses froze. Ice cubes. 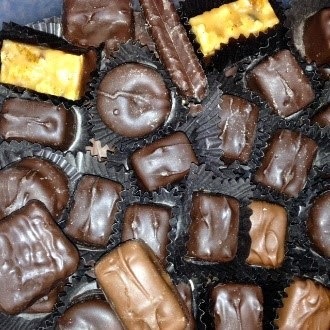 They are now beginning to melt, but haven’t fully thawed. This has affected my writing. I feel that my descriptions of characters and settings have become as interesting as, well, a pile of grimy snow. Time to take charge and kick all my senses into high gear! I began with hearing. I had become so used to everyday winter background noises (snow plows and shovels) that I tuned everything out. To counteract this, I sat in a quiet place, closed my eyes, and just listened. I heard the rumble of a truck, the neighbor’s Sheltie bark while on his morning constitutional, and a cardinal sing. Then I covered my ears and listened to my heart swish as I breathed slowly in and out. Next, I worked with my sight. I take it for granted and should know better since I lost sight in one eye and went color blind for a year due to an illness. 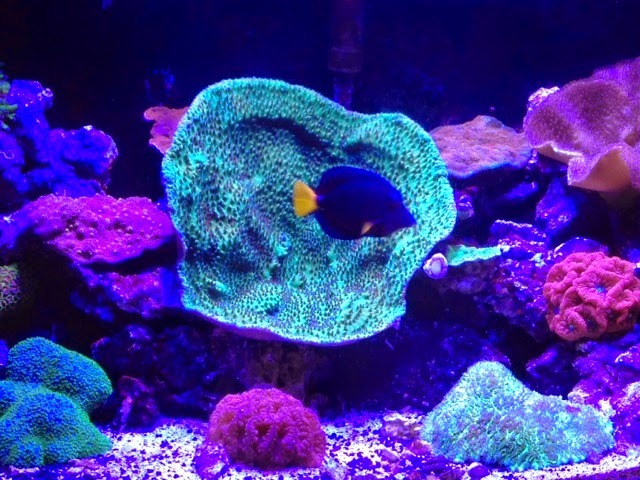 To renew this sense, I spent time watching my husband's colorful fish and corals in their salt water aquariums. Blue, magenta, green, orange--a rainbow of living colors. Because the heat in the house is constantly running, my nose is stuffy and my sense of smell is off. 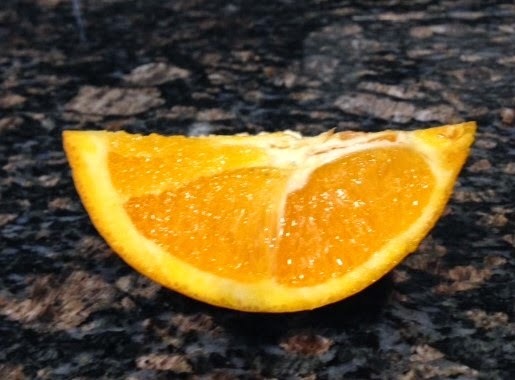 I sniffed a tangy orange then graduated to stronger scents of cinnamon and clove. I finished with pepper which made me sneeze. This winter I wore gloves inside the house since my hands were cold and sometimes numb. To stimulate touch, I took off my gloves, warmed my hands using a jasmine scented heat pack, and touched. The carpet felt nubby, a silk skirt slick, and a blanket soft. What about the sixth sense of intuition? 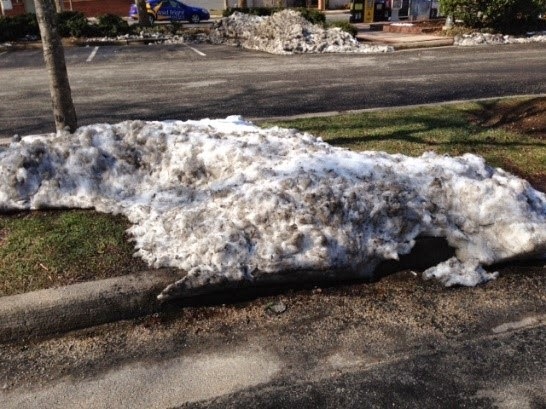 Mine was strong, but has weakened over this endless winter. I’m not sure how to reinvigorate it. Perhaps by being mindful and paying attention, that sense will expand as well. Hopefully, when my senses finally reawaken, my written description of characters’ worlds will be reenergized. I want to transport a reader to a character’s world using descriptions that stimulate all the senses--to immerse themselves in a warm sauna of words that flow from the page. Don’t all writers want that? To create living, breathing worlds that are as real and sensual as our own (at least in any season but winter)? Do the seasons, or lack of them depending on where you live, affect your writing?